Alliteration: "Why her smoldering eyes stil scorch my soul?" Anti-Hero: Esmeralda is a Type II, while Clopin is more of a Type IV. The villain's also a genocidal racist (as demonstrated when he crushes ants beneath a stone block while talking to Phoebus to show what he will do when he finds the Gypsies) and telling the Gypsies he's just rounded up, "There's a bonfire tomorrow. You're all invited." Dude in Distress: Phoebus and Quasi find the Court of Miracles. 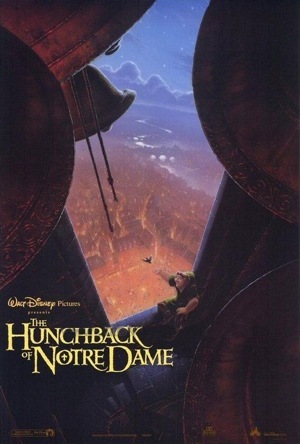 They are Bound and Gagged by Clopin and the gypsies, mistaking them for "Frollo's spies", leaving Esmeralda to save them from an untimely execution. Freudian Trio: Hugo is led by whims, Victor is very moral, and Laverne is in the middle--Id, Ego, Superego. He Who Fights Monsters: Clopin. He was perfectly willing to execute a pair of Esmeralda's friends because he thought they were spies of Frollo. All-Knowing Singing Narrator: Unlike most narrators, Clopin is actually a significant part of the story, though he enjoys himself far too much considering what is going on. Tempting Fate: Frollo says, "And He shall smite the wicked, and plunge them into the fiery pit!" ... whilst standing above a fiery pit. This page was last edited on 10 August 2017, at 14:17.